Unless you want to fall for an Antichrist spirit, here, enter a story that will spin your mind on how deception really, really, works. In Great Britain, it was the populous movement that was all excited about Brexit, yet few understand the secret powers workings behind the scene. The United Kingdom’s referendum to secede from the European Union was trumpeted by Brexit campaigner, British Foreign Secretary Boris Johnson. To make Brexit happen he sent out messages and leaflets telling the English that if Britain does not secede, the Turks and the Syrians will flood their country and destroy their way of life. Now, that Brexit is all over, that same Brexit campaigner is aiding Turkey to enter (not abandon) the European Union. One E.U. member, two days ago spilled the beans and sounded the alarm. Senior German member of the European Parliament Manfred Weber said Mr Johnson’s activities were “unbelievable” warnings about Johnson’s attempts to bring in Turkish migrants during the UK’s EU referendum. It is time to learn how to be as wise as devils. In other words, for populist Johnson, before Brexit, it was a ‘disaster’ to allow Turkey entry, and now that the Brexit operation is all done, it is okay for Turkey to enter the E.U. This spells out ‘controlled opposition’. When Jesus said “beware of wolves in sheep clothing” the correct interpretation is “beware of controlled opposition”. To put it bluntly, Boris says ‘lets ruin Europe,” but first “lets get the hell out”. Now this same Boris is on a campaign trip, not to rid Europe from Turkey’s entry in the E.U. but to add Turkey in the E.U’s membership. This will give Turkey an unrestrained right to flood Europe with Muslim immigrants. This will fragment the E.U, by bringing in more destabilization in order to bring more power to Germany and Turkey. This will usher in populous nationalism which is at the heart of this global revolution. So what the hell is going on, and why would an Englishman betray his nation? What should be even more shocking, is that British Foreign Secretary Boris Johnson is not really Boris Johnson. He is originally a Turk: Borris Ali Kemal Bey, a Turk, whom Erdogan would love his anti-Kemalist secular views. Relations between the EU and Turkey have become strained because of the crackdown by Turkish President Recep Tayyip Erdoğan following a coup attempt in July. Yet the EU and Turkey are partners in an agreement on the return of migrants who have fled to Europe — a deal that was tied to billions in aid for Turkey by Germany. So it is a temporary love affair between Germany and Turkey, where the spawns of satan would flood Germany with Muslims, while pro-Turkey evil elitists plan to revolutionize Europe. These same spawns of satan, I call ‘Hagar’s Ishmaels’, must leave the promised land after the deal is over and after the people go in an uproar over the Muslim immigration issue. Which is exactly what we warned about exposing the Unholy Seven Sacraments from hell, which explains in detail how the populists, while they will cry “we do not want Muslims” in reality their leadership has an Anti-christian agenda, to prostitute the west, to go in bed with Turkey. Everyone knows that if Turkey is allowed into the E.U., it is the end of Europe as we know it. Here is where the regular Christian Joe can begin to understand the players as to who are the good, who are the bad and who are the extremely ugly. Populist leaders will simply do the devil’s bidding to re-rise Islam’s neo-Ottomans so long they unite with their liberal Darwinian evolution. They will do this, despite anything they will promise the masses. These types give an ora of being all about ‘the people’, while they condemn the media that exposes them. The Brexit elitists were set to remain politically irrelevant, renegades confined to Farage’s UKIP party of pub revolutionaries and armchair rebels. Not anymore. These will attempt to spark from the U.S. so pray that Trump does not fall, although we doubt that he is immune. While what I said here will upset many, it was we who warned of Romney, back in 2012, while he was ‘popular’ to only have the crowds hate him, way later, while forgetting ‘we told you so’. Populist elitists (just like Martin Luther, the King of populism) can read and articulate the feelings and desires of their fellow countrymen and will use trickery, ear tickling and manipulation, in order to attract the trust of the masses and then gain seat of power. I urge people, particularly during Ramadan, to find out more about Islam, increase your understanding and learning, even fast for a day with your Muslim neighbour and break your fast at the local mosque. I would be very surprised if you didn’t find that you share more in common than you thought. In other words “convert to Islam”. ”Muslims are at the heart of every aspect of society. Their contribution is something that all Londoners benefit from. Muslim police officers, doctors, scientists and teachers are an essential part of the fabric of London. Being from Oxford University, it is no surprise why Boris (Ali) says this. Conservative philosopher, Roger Scruton, said that while he was at Oxford, almost everyone was homosexual. It is the type who Christians need to beware in these signs of the times. And to make my point clear from Christian history. Solomon the wise once said, that history (prophecy) simply repeats itself. Nero, the spirit of the rebel, will always want Rome burnt to destroy Christianity. And now these populists want Europe and specifically Rome destroyed. The idea of ‘combating Muslim immigration’ as George Friedman of Stratfor said “there is no refugee crisis”. This is why we posted: There Is A Major Global Conspiracy Being Planned Out To Convert Millions Of Americans To The Religion Of The Antichrist, To A New Form Of Islam And To The One World Order Of Satan. The evidence is clear. If such populous rebels are for ‘the people’ why is this British Foreign Secretary, Boris Johnson (Ali) now offering to assist Ankara in its negotiations to join (not abandon) the EU? Therefore, it would be wise to understand the signs of the times that ‘confusion’ would be rampant to deceive even the “very elect”. Initially it was UK’s Foreign Secretary Boris Johnson who exerted a strong influence on growing Eurosceptic sentiment among the British right-wing. Now this same UK Foreign Secretary tells Turkey that he supports its bid to join the EU? The one German MEP (who has not fallen for the dark plan yet) has launched a scathing attack on Boris Johnson, demanding the Foreign Secretary keeps out of the European Union’s discussions with Turkey. These are the powers at play. These are the forces of Antichrist fully on the move. For years, many said that ‘Antichrist will be charismatic leader who manipulates the people’. Yet the very warners and so-called watchmen, are falling right into the very trap going ‘against the people’s interrests’. This might get me into hot water, but I’ve been there before. Race is more than skin deep, no ifs or buts about it. On average, Orientals are slower to mature, less randy, less fertile, and have larger brains and higher IQ scores. Blacks are at the other pole, and whites fall somewhere in the middle, although closer to the Orientals than the blacks. In sport, blacks have a genetic edge. They have narrower hips which give them a more efficient stride, and a higher centre of gravity for better balance. They have wider shoulders, less body fat, and more muscle. With more testosterone than whites and Orientals, they possess more explosive energy. Ergo their superiority in sports such as boxing and sprinting. According to J. Philippe Rushton, professor of psychology at the University of Western Ontario, the reason why whites and East Asians have wider hips than blacks, and as a result are poorer runners, is because they give birth to larger-brained babies. It all has to do with climate, according to the good prof. Modern humans evolved in Africa about 200,000 years ago. Africans and non-Africans then split about 100,000 years ago. The further north they went, the harder it became to find food, raise children and find shelter. Larger brains were needed for a longer life and more family stability. Lets keep in mind, it was Rushton who influenced the German AfD party. This whole racial differentiation that ‘Asians are better’ is hinting that Asia Minor’s Turkey, Japan and Boris’s ilk, like Nordic Germany, have a master plan to become masters of this world through pan-Asianism. The Young Turks took this Darwinian evolutionary idea, to promote that it was the Asians are ‘master race’ and Boris knows this and wants to please his masters. Therefore, this new Reich, is a combination of ‘Nordic’ and ‘Asian’ mix: a German, Turkic and Japan evil alliance. It is no wonder that a Turk, according to Prophecy, will rule Germany and supposedly leave his Islam, when in reality, all these are part of this movement I call unholy seven sacraments. It is crucial the wise do not simply look at “Islam” as the sole enemy, but all seven unholy sacraments, from Evolution, Eugenics, Homosexuality, Occultism, Pseudoscience, Abortion and Racism. This is exactly what the Nazis believed in. Ali Kemal is the great-grandfather of Boris, England’s Trump and the apple did not fall far from the tree on the importance of having ‘great genes’. Genetics play a major role in the Eugenic’s mind. What you see in Boris, a European look is not simply from his English links, Ali Kemal’s mother was a Circassian, reputedly of slave origin. Circassians are blond white like Boris, while these believe the Turk to be ‘European’ and therefore part of the ‘select race’ even if they are Asian. On one of several visits to Switzerland, his great grand father met and fell in love with an Anglo-Swiss girl, Winifred Brun, the daughter of Frank Brun by his marriage to Margaret Johnson. “his blood-covered body was subsequently hanged with an epitaph across his chest which read, “Artun Kemal”“. This bestowal of a fictitious Armenian name administered a final indignity to the victim. He was considered a Quisling. So like Erdogan’s anti-Ataturk hidden mindset, Boris, like his ancestry would believe the same as Erdogan, even including his promotion of Islam. 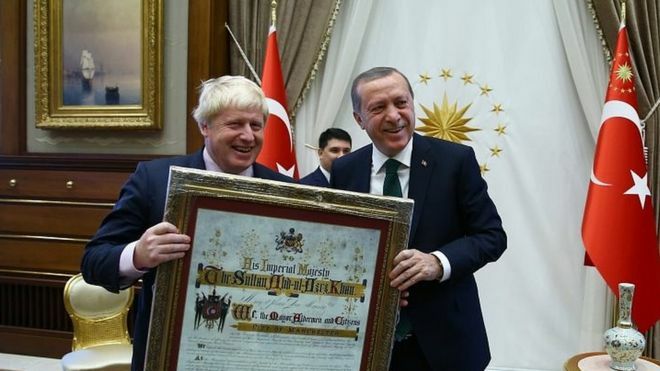 And it is not like Boris is disconnected from his Turkish past. This grandson of Kemal Ali Bey went on a lifetime voyage to find about his Turkish ancestry. He started with birth certificates even traveling to Istanbul finding an ancestor and talking to relatives still living in the local area. Then his search even grew to find and meet academic experts and visiting archives all provided by the neo-Ottoman regime. Boris met up with one of his cousins, Sinan Kuneralp, who is a grandson of Ali Kemal. Sinan showed Boris the area where Ali was born and raised, described his traditional education at a Koranic school. Boris then began to appreciate his great-grandfather’s traditional Islamic roots. Ali, like Boris, had been both a journalist and a politician. More significantly though, Ali had been active during a controversial and turbulent period in Turkey’s history and Boris dug into the articles by Ali written in the Old Ottoman (Arabic script that later was eradicated by the new republican Ataturk’s government). He went through the whole gamut, finding local researchers or translators which can be a tricky, time consuming and potentially expensive process, contacting local universities and libraries for recommendations of freelance researchers or students who could take on private research or translation work from the UK and in Istanbul. Ali, like Erdogan, ordered everyone to ignore the extremely popular nationalist Mustafa Kemal, in effect publicly denouncing the man who would later become Turkey’s reforming hero, Mustafa Kemal Ataturk. Beware of the spawns of lucifer. They are even born in your midst, while they chant what you love to hear. You on the other hand do not know you are simply singing their conspiratorial songs, while you get sold as slave at the bazaar to be consumed by Antichrist.